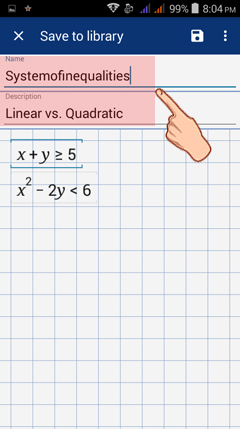 If you decide you want to use the same calculation in a different workspace, you can save your results (or graph) to the library. 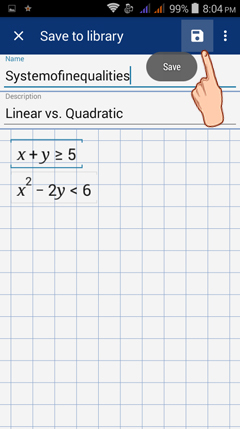 Step 1: In the calculator window where your results are displayed, tap the options button on the upper right corner of your screen. 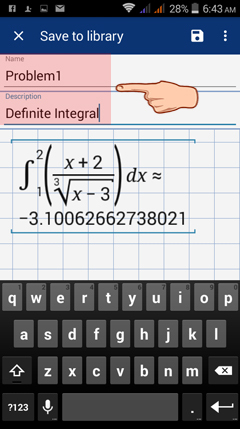 3) Tap SAVE to LIBRARY. 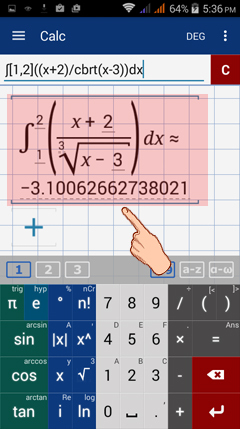 4) Add the expression to the library by tapping + (plus sign) in the bottom right. 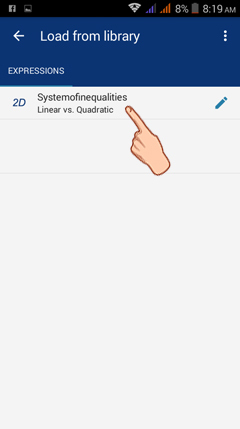 5) You can then add a name and description for the expression/equation that you want to save to the library for easier reference. 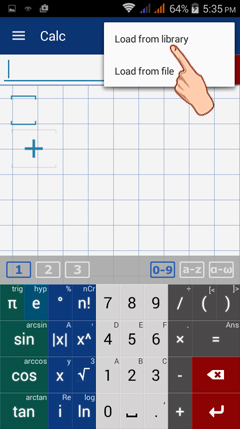 6) Tap the SAVE icon - a disk icon in the upper right-hand corner. The word "SAVED" will then appear on your screen, meaning that the expression has been successfully saved to the library. 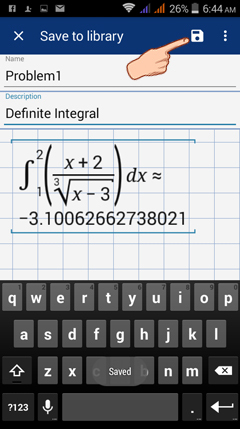 1) In the CALC window, tap the options button. 3) Tap LOAD FROM LIBRARY. 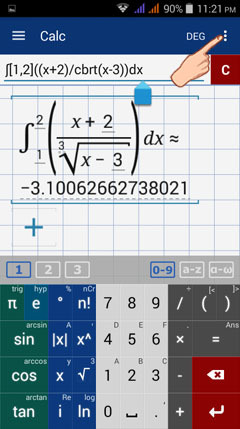 4) Tap the name of the calculation that you want to load. 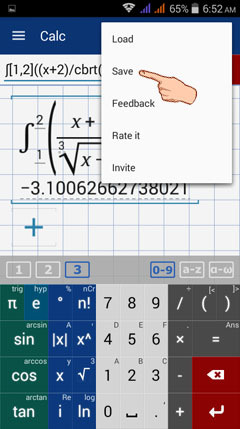 The calculation result will then be displayed in the Calc screen. 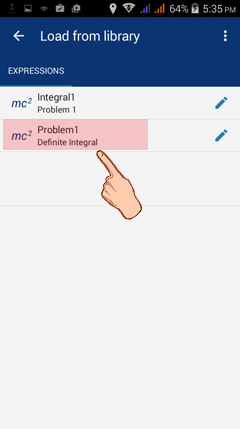 1) In the Graph window where your graph is displayed, tap the options button and tap SAVE. 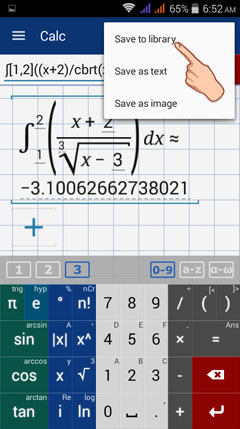 2) Tap SAVE TO LIBRARY. 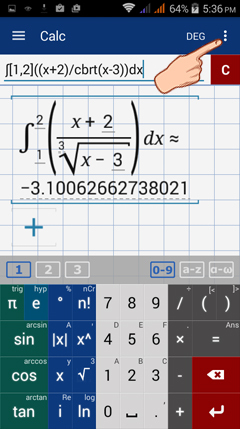 3) Add the graphed expression(s) to the library by tapping + (plus sign) in the bottom right. 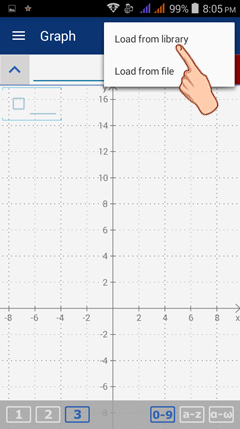 In the expression editor of the library, you will only be able to see the expressions you used to make the graph. When you load them, they will load with their respective graph. 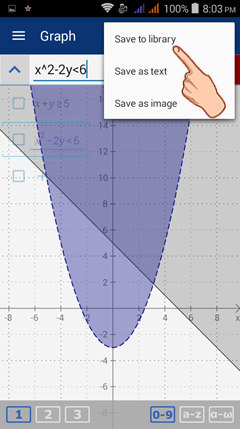 When you save the graph to the library, you may want to add a name and a description for easier reference. 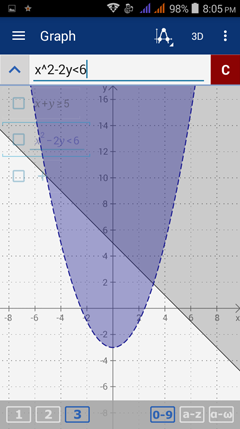 The name of the graph should not have spaces between words. 4) Tap the SAVE icon - the disk icon before the three dots in the top right corner. 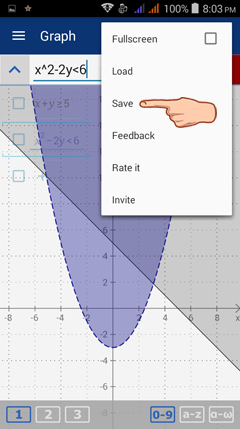 5) Tap the BACK button of your phone to switch back to GRAPH MODE. 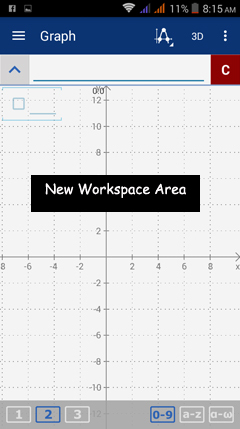 To test the graph, open a new workspace area. 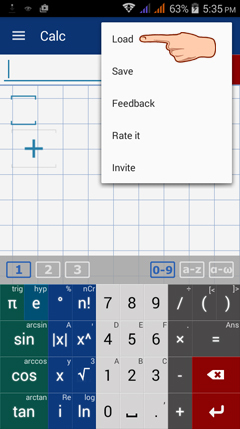 6) Tap the options button and tap LOAD. 7) Tap LOAD FROM LIBRARY. 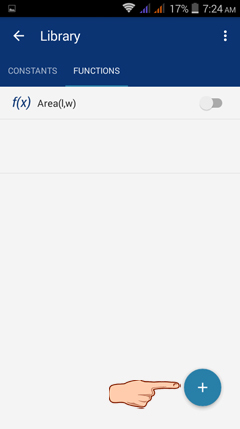 8) Under LOAD FROM LIBRARY, tap the name of the graph you want to use. 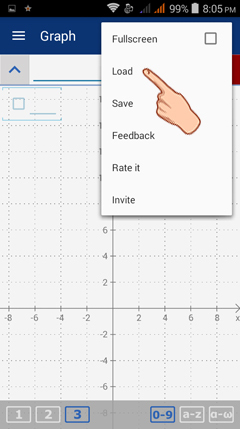 You will be redirected to the GRAPH window displaying the graph that was saved.